We have a great new product from The Vintage Shop, a Twin Roller Mill. Give your arm a rest - there’s an easier way to make great beer than grinding the old fashioned way. The Vintage Shop durable mill will efficiently turn even the most stubborn grains, corn and malted barleys into the perfect base. 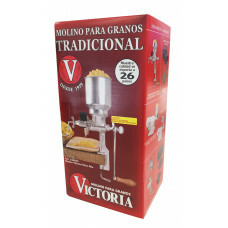 When using this with the Grainfather, set the mill at 0.5 mm for the best crush. This 1amp, 240v motor has been coupled with a high torque (1:7.5ratio) gearbox to bring the RPM down to the perfect milling speed of 180rpm. This motor is made to be direct drive and will couple with the Maltmuncher Grain Mill (2 and 3 roller) using the included spider coupling with polyurethane cushion (spider coupling will suit 10mm and 12mm shafts). The motor mounting plate and spider coupling make it easy for you to mount the motor and mill together. 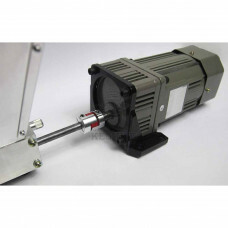 The cast alloy motor housing and mounting bracket are robust and quality made. The housing is sealed and practically maintenance free. The mill motor kit also includes a kill switch for your safety. 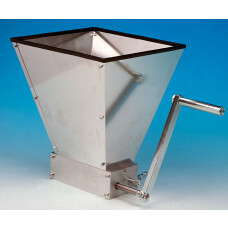 The MaltMuncher Grain Mill (three roller) is constructed using materials that will last a lifetime. Cold rolled steel for the rollers, 6061 Aluminum body and hopper with long lasting hardened steel bearings. The 3 roller design has the main advantage that it draws the grain better and gives improved throughput.